Red and green are not just for Christmas. 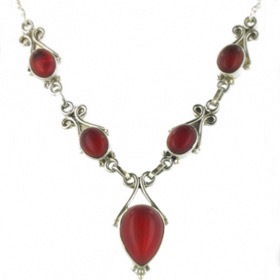 A red onyx necklace is a warm, spicy red excellent against golden skintones. 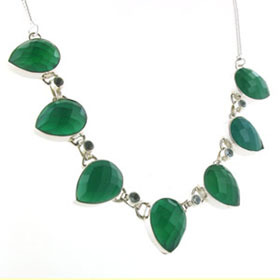 A green onys necklace is a vivid emerald green perfect against cool skintones. 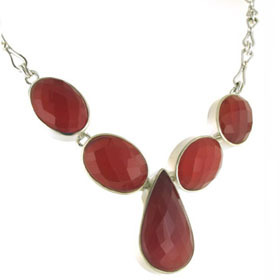 These fabulous, richly coloured gemstones are shown at their best in these chunky, bold necklaces. 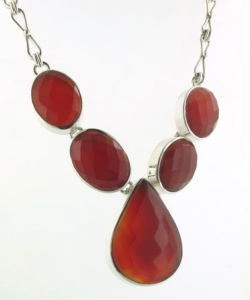 Team up with a pair of green onyx earrings or red onyx earrings and wait for the compliments. Faceted green onyx necklace interspersed with blue topaz gemstones.